It’s Tamiya time again, as the Japanese company rolls out its 1:10 scale Radio Control Lancia Delta Integrale (top pic above). 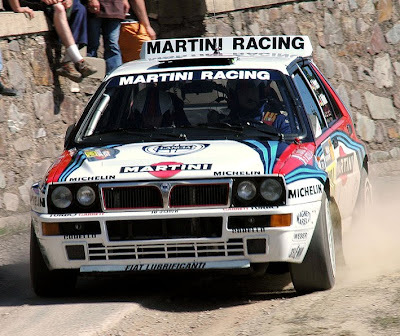 If you like Jeremy Clarkson’s ‘Top Gear’ TV series, then you may have seen the recent edition featuring Lancia’s many oh-so-desirable cars, including the square-cut Delta Integrale. It was a rally winner many times over, and still runs as a modern classic in events such as the 2007 Deutschland Rally (middle picture). As for Tamiya’s R/C Integrale, it comes well up to the mark, scaling out at some 407 mm (16 in) long, which makes it a chunky beast indeed. It’s fair to say that the lightweight plastic body is nowhere near as detailed as an injection-moulded kit, but from a short distance away, the effect is very realistic indeed. And with such a low centre of gravity, cornering is likely to be roll-free except in the most extreme manoeuvres (erm, confession time - the SMN Crew really, really likes bad things like that). Enjoy the video too, and crank up those speakers for a suitably rock n roll sound track! 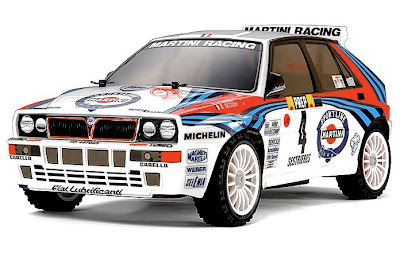 The Delta Integrale will be available soon, and is of course only one of many Tamiya R/C vehicles, some of which you can see here.